(Seattle, WA) – In Seattle, beer and coffee are like siblings, jealously dividing the day. It’s a ticklish point as evening approaches, in fact, when the joys of the one give way to the other. And along with other more hard-bitten local industries, they compete for the attentions of a creative and often otherwise-distracted workforce, dividing the hip and tattooed into brewers and roasters, barkeeps and baristas. Split Shot Espresso Milk Stout brings all that together, combining the talents of Elysian Brewing and Stumptown Coffee in a deliciously smooth, very Northwest beer. 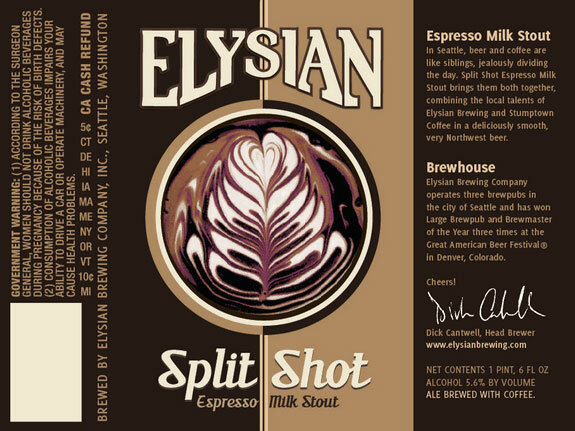 Split Shot made its first appearance as the official beer of Seattle Beer Week back in 2012, and now it’s back as Elysian Brewing’s spring seasonal offering. Beginning January 1, 2014 Split Shot will be available on draft and in 12-ounce six-packs throughout Elysian’s distribution network. Look for a limited amount of nitrogen-poured draft–a real Cascadian cascade. A complex bill of malts hold it all together–Northwest pale, C-15 and C-45 dextrine malts, Franco-Belges kiln coffee malt, Black, Roasted and Chocolate malts and flaked oats. Magnum hops add a touch of bitterness and milk sugar sweetens just a bit. Cold-infused Stumptown coffee provide an invigorating richness. With an original gravity of 18.5° Plato/1.074 SG and an alcoholic content of 7.25% by volume, Split Shot will warm and sustain through spring’s cool evenings. The combination of coffee and stout will definitely keep your attention. Elysian Brewing Company operates three neighborhood brewpubs and a production brewery in Seattle, WA. Known for variety, Elysian has brewed more than 200 different beers since opening its doors in 1996.